I’ll be honest. Today’s post was supposed to be a read pile review of this Centipede comic that I’ve been reading recently. The problem is I procrastinated too long between when I finished the book and when I sat down to write the review, so I have already forgotten a lot of the points I was going to make in it. So now I need to kill time with another article while I spend the next couple of days reading it again. Now I know what you are thinking. If I’m going to have to spend more time re-reading a book again and again just to write this read pile article, then why do you ask did I not just write the damn review when I actually finished reading the book originally? 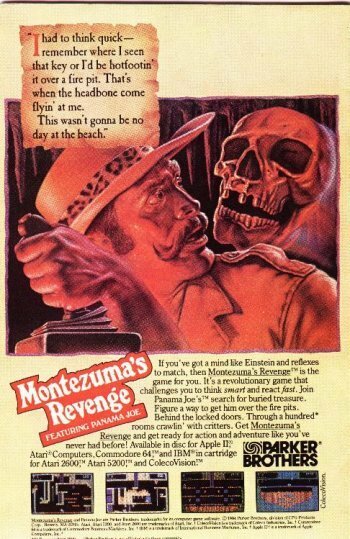 Ah, Montezuma’s Revenge. Long before it was a name for the poops you get from drinking the water in Mexico, you were this some what complex video game from the brains over at Parker Brothers. I never got to play this game as a kid, but it seemed like the closest thing you’d get to playing an Indiana Jones game. Turns out years later when I finally did get to play it, it wasn’t as “all that and a bag of chips” that my 6 year old mind thought it was. It was more “not that and a bag of unsalted pretzels”. Didn’t stop me from playing it for 2 hours earlier this week on one frosty winter night though…probably as an excuse not to write that read pile review I mentioned earlier. Panama Joe, you’ve done it again. As part of my New Year’s resolution to stop crapping on DC comics so much, I decided to brush up on my history by revisiting some of the silver age classics from that hallowed publisher. I mean I really do love reading silver age Marvel, so ergo I thought I would silver age DC just as much. And in searching over my shelves for some late night winter reading, I remembered that I had picked up a copy of The Legion of Super Heroes Archives Edition Volume 1 at someone’s garage sale a couple years back in fairly decent condition. My Dad had some Legion of Super Heroes comics in the attic when I was growing up which I guessed he had picked up as a teenager. That and a bunch of Superboy comics. But regardless, I would sometimes go up there and sit and read those issues on rainy days when I had nothing better to do. And so that feeling of nostalgia and the smell of moth balls must that drove me to pick up the book at that sale so many years ago, just like it compelled me to finally read it recently. I just gotta start by saying I’m glad I originally read these books when I was a kid of 7 because God knows they don’t make a lick of sense now. I mean I’m used to some of campy simplistic fun that comes from some Silver age books, but man, does the Legion of Superheroes take that to a whole other level. I mean…it’s just plain goofy, like over the top goofy…futuristic space milkshakes and labels on absolutely everything kind of goofy. Seriously they not only put labels on their uniforms with their super names, but then they also have little labels on cards in front of them saying what their super power is. Talk about over explaining things to the point where it becomes absurd. No wonder they want Superman to join their ranks, he just has a “S” on his chest. That kind of radical simplification of their current labeling model could be revolutionary. Maybe their team meetings wouldn’t take 3 hours just to get through the opening role call. Anyways, although most of the early issues are appearances of these 30th Century super heroes occur in the pages of either Superboy or Supergirl, eventually they start getting their own stories mainly about adding exponentially stranger members to their ranks to the point it becomes somewhat comical. I mean, sure, some of the stories deal with those they reject from their exclusive “student council”esque club of super teens. Most of those are rich stuck up kids that try to either fake their superpowers with technological tricks or simply try to buy their way on to the team with bribes. But a lot of the rest of these stories deal with freaks of nature type characters that have no business being in a super hero book proving themselves as invaluable members through defeating equally laughable villains. Like the issues with Bounce Boy who proved his worth by defeating a electricity based criminal because he never touched the ground due to his constant bouncing. That seems to conveniently forget every superhero that flies or even remotely floats off the ground, but whatever. And don’t get me started with the Matter Eater Lad issues and how he tries to explain how his powers would be useful instead of being just a complete circus freak. 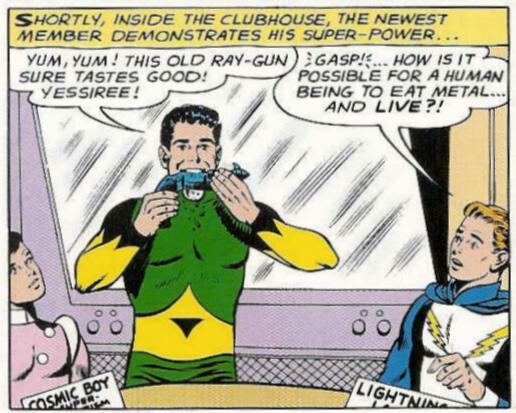 Yep, not only can he eat a bad guy’s ray gun but if the Legion every got imprisoned, he’d just eat through the bars. And if there were no bars, just pour maple syrup all over the floor and watch how he digs an escape tunnel. And I could go on about one of the infamous issues of Supergirl that just happens to randomly appear in this collection, where Supergirl tries to fix up her cousin up with every able bodied female in the DC universe in seems in her bizarre quest to get him married and settled down. And the strange tenacious way she goes about this search, like its a biblical prerogative is downright creepy, watching him drearily from a far while her cousin kisses an never ending parade of ladies. However it’s nowhere near as creepy as what Superman says once she spills the beans about what she was up to. Yep, if it weren’t for those damn ancient laws from a long dead planet that blew up billions of miles away, Supes would be all about banging his blonde super cousin. Maybe he should have just built his Fortress of Solitude in West Virginia. Sorry to our West Virginia fans…you knew that joke was coming. Once in a great while I feel like ditching all these comic books, and devoting myself to another great passion in my life: the pursuit of good music. Especially good music that exists on vinyl records as I feel like the pure power of that medium of musical conveyance will never be completely crushed out of existence even with all the technological strides we’ve made as humans over the years in digitizing our audio libraries. Sure, some may joke about it being a purely hipster pursuit, but try telling that to all of the fans we have of GotS’ own DJ Dinner. He’s tapping into a real movement within our culture for reevaluation of the great things to be found on vinyl and the the appreciation for the notion of the album. Not a single, but a complete album, with both an A and B side, and the ebb and flow that comes from listening to it as a complete work. And once in a while I find an album like that in that it hearkens back to the same notions that DJ Dinner is spinning with his reviews. 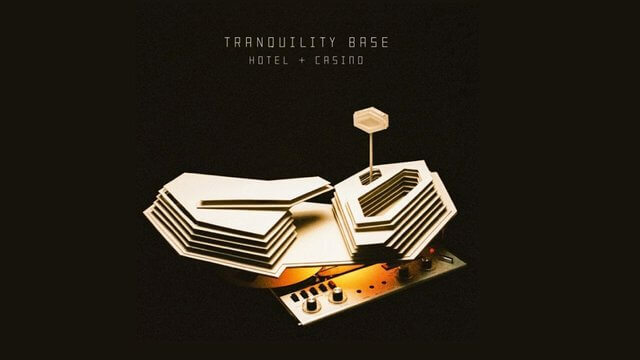 Recently that was Arctic Monkey’s newest release,Tranquility Base Hotel & Casino, which should find a place in anyone’s record collection along side their Pink Floyd’s “Dark Side of the Moon” album. It’s definitely a different sound that their previous album “AM” which contains the alt rock hit “Do I Wanna Know?” which was thus far the only song of theirs to crack the Billboard Hot 100 in the US. “AM” was more the standard driving guitar licks and bum rattling bass line that most people are familiar enough with to get behind. “Tranquility Base” is more of an eccentric mix of jazz, new wave, and psychedelic pop. Again, I’m not sure if that sound is going to find a place in with the mainstream audiences, but forthose of you that have been huge fans of Bowie, Leonard Cohen, or David Gilmore, this is right up your alley. Personally, I applaud the band for taking a chance and putting out something fresh like this. And I feel like I’m not the only one that things so. As I mentioned wanting to own this album on vinyl, it seems like a lot of others did too as it was the UK’s fastest-selling vinyl record in 25 years. That’s a lot of audiophiles coming out of the woodwork to support a particular album. But don’t let me sell you a bill of goods without giving you a chance to listen for yourself. Here’s the title track. Is this Grammy worthy? Will it win Best Alternative Music Album? Leave me some comments and let me know what you think! Every winter season, I usually take time to catch up on some of the video games I’ve amassed for my PC over the year through various sales. It’s mainly because my PC is in my office and my office is where the fireplace is (as anyone that has watched a GotS promo will attest to). So during those cold winter months, most of my family crams into that small little back room to enjoy a good roaring fire in hopes of staving off the bitter chill. 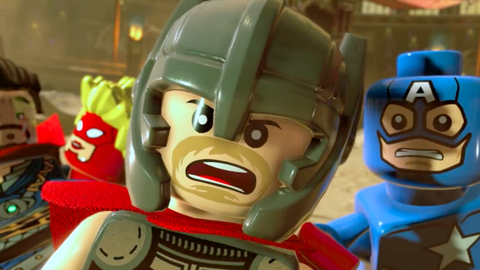 One such video game that I’m finally getting around to playing with my son, Jakob, is the 2017 sequel to the original Lego Marvel Super Heroes game called…ummm…Marvel Super Heroes 2. I know real original, but hey at least it tells consumers exactly what they are getting themselves in for. Anyways, the story line centers around Marvel supes from different eras and realities as they fight against most excellent time-traveling villain Kang the Conqueror as they try to stop him from conquering all space and time. As someone that has always loved the villain of Kang and thought it was a raw deal that his character rights being wrapped up in Rama Tut precluded him from appearing as a villain in any of the Avengers films, I for one was excited just with the simple prospect of getting to have a chrono hopping style adventure starring the artist formally known as Scarlet Centurion. And I gotta say, thus far, the game does not disappoint. 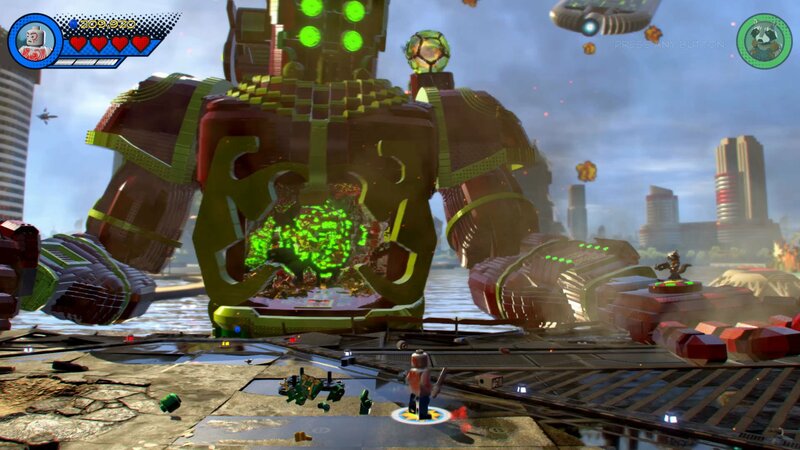 Even from the opening stage in which you get to play as the Guardians of the Galaxy as they fight a giant zombie Celestial, you know you are in for a real treat in terms of a game for Marvel fans. But I gotta say the most interesting aspect of the game play actually has to do with the manipulation of time itself, which is fitting for a game all about Kang. With these Doctor Who like wibbly wobbly timey whimey powers, players can change the look and abilities of certain characters. For example, you can take Baby Groot and move time forward for him to become his adult version. Also Spider-Man can go both ways in time, transforming him into both his past incarnation with Spider-man Noir look or the future Miguel O’ Hara 2099 counterpart. Of course, I’ve barely scratched the surface of all the Easter Eggs and unlockable characters you can get in this game, but based on all the hub bub I’ve already read about all the characters and the add on level packs you can get I’m super pumped. I mean just listen to this laundry list of pretty obscure characters you can get: Kraglin, Stakar Ogord, Tullk, Ego, Okoye, Nakia, Everett Ross, Ulysses Klaue, Erik Killmonger, Cloak and Dagger, Mister Negative, Blackout, Shroud, Nightmare, Silvermane, Nico Minoru, Chase Stein, Alex Wilder, Karolina Dean, Molly Hayes, Gertrude Yorkes, Old Lace, Hulkbuster 2.0 adolescent Groot, Thanos and the Black Order (consisting of Corvus Glaive, Cull Obsidian, Proxima Midnight, and Ebony Maw), the “Ant-Man and the Wasp” version of Ant-Man (Scott Lang), the MCU version of the Wasp (Hope van Dyne), Crossfire, Egghead, the MCU version of Ghost, Giant-Man (Raz Malhotra), The Human Fly, Stinger (Cassie Lang), Spider-Gwen, a cowboy version of Captain America, Iron Duck (who is merely Howard the Duck wearing the Iron Man’s armor), a medieval counterpart of Hulk, and Carnom (a fusion of the Venom symbiote and the Carnage symbiote)….whew. That’s a mouthful. Will I end up pulling a Pokemon and “catch ‘um all”? I’m not sure, but gosh with a list like that and a son like Jakob that’s already somewhat of an obsessive compulsive collector, I gotta say I will definitely give it the old college try! Yeah, this section is somewhat of a cop out this month. I would like to go on the record as saying that this is not my current favorite movie at all. In fact, the only reason I saw it in the theaters was that during a recent business trip to Chicago, I had some time to kill by myself, and seeing that Chad absolutely despises the movie “Unbreakable”, I figured there would be no way I could talk the other Ghosts into going to see this comic book related movie in order to review it. So I bit the bullet and went to see it, given that we are a comic book podcast/blog, and although this movie doesn’t feature any comic book characters per say, it’s deeply influenced by comic book culture, and the GotS should comment on it. I will say point blank again, that this is not a good movie. It was definitely not a movie I would have seen in a movie theater if I didn’t have this blog. In fact, the notion that it’s doing fairly respectably at the box office pretty much astounds me as I feel like the only other people that would pay money to see this would be those that have comic book blogs too. But people also shelled out tons of money for Aqua Man and even thought that was a better movie than Solo: A Star Wars Story on our Twitter Poll, so yes, there are truly signs of the upcoming apocalypse all around us if we but look. However I also have to be honest that I might have watched it on video eventually. This is mainly because I liked the movie Unbreakable so much, and I still do to this day. Now I get again a lot of sh*t about this from by Ghost Co-Host, Chad Smith, but what can I say? That movie has a lot of good things going for it. It’s from M. Night Shyamalan’s early days before The Village when he was still putting out half way decent films. It’s got the dynamite pairing of Bruce Willis and Samuel L. Jackson who have appeared together in some of my other favorite films “Die Hard with A Vengeance” and “Pulp Fiction”. However, the biggest reason I love it was because it came from the year 2000, a somewhat dark time for comic book movies, in which the public had not yet embraced them as they now currently do. I mean the original Batman series had come to a crushing end with “Batman & Robin”, Bryan Singer’s X-men had only just came out a couple months before and although it was a win for some comic fans, I never particularly thought it was very good. I mean I still get the chills with the scene where David Dunn bench presses the weights very quietly and deliberately, with all the dignity and grace that we expect from our super heroes. That humble nature that makes us love and root for characters like Superman all these years. 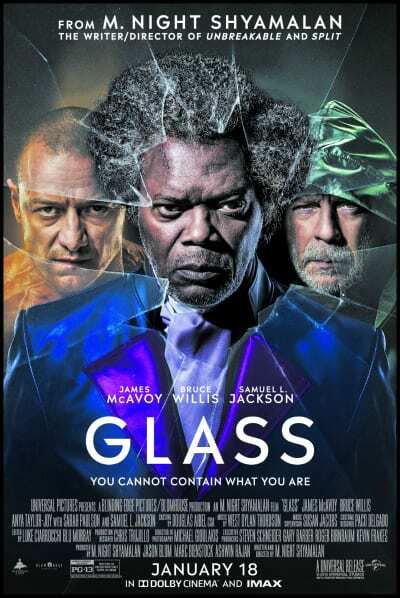 But this is not a review on Unbreakable, although I will say that it probably would fit the Current Favorite Movie moniker better than Glass does. No, no, this is a review of Glass and a mini one at that given, I really don’t think it’s worth spending an entire article dissecting it. I’ve got depression, but I can also curl my tongue because of my unique genetic makeup, However, you are obsessed with curing me of both? What? I’m not sure the second one is something that can be helped or has any bearing on the depression, thanks. 2. It’s not really necessary to have seen “Split” previously to enjoy this movie. They spend a lot of time fleshing out Crumb aka “The Horde” in this movie as is. However, not seeing “Unbreakable” will leave you at a very distinct disadvantage. 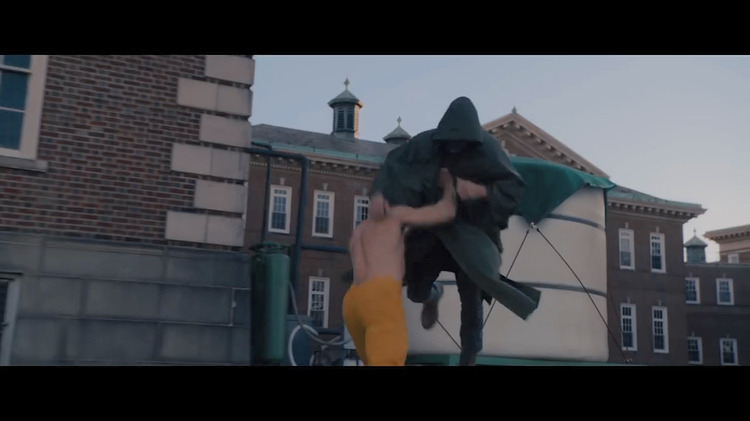 BTW, the Dunn/Crumb fights were definitely the best parts of the movie in my humble opinion. 3. Finally, for those of you wondering whether there was that signature M. Night Shyamalan twist at the end of the movie, there was. Well, in fact, there are several. However, none of them were out of left field. They all made sense to a certain degree and fit within the context of the movie. I’m not going to spoil them though, because, who knows, someone out there might actually be a fanatic about these things and hate me until the end of time because I spoiled “The Twist” before they could watch it.